How many right-angled triangles are there with sides that are all integers less than 100 units? Each of the four sloping beams is the same length. 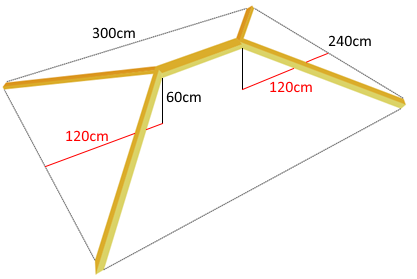 The roof of the shed is 300cm long, 240cm wide and 60cm high. What is the total length of wood needed to make these five main beams for the roof? Can you reduce the amount of wood needed by changing the lengths marked in red? Pythagoras' theorem. Visualising. Creating and manipulating expressions and formulae. Triangles. Area - circles, sectors and segments. 2D shapes and their properties. Mathematical reasoning & proof. Sine, cosine, tangent. Regular polygons and circles. Similarity and congruence.